On 21 July 1969 (New Zealand Time) man first set foot on the moon. The American astronaut Neil Armstrong, the commander of Apollo 11, watched by millions of television viewers around the world, stepped off the ladder of the lunar module, Eagle, on to the moon. "That's one small step for man, one giant leap for mankind," he said. Our school teacher brought a TV into the classroom and we watched in wonder as this historic event unfolded. First, there was the launch of the giant Saturn V that carried the tiny capsule with the first men who would walk on the moon. Daily, we followed their progress until finally, they came to the point where the lunar module separated for the trip down to the moon's surface. The first time they stepped out on to the surface came when we were supposed to be at school. So lessons were put aside as we watched those grainy black & white images of Neil Armstrong stepping out onto the lunar surface. $1.50 - Neil Armstrong / First Man on the Moon. 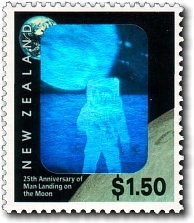 In July 1994, New Zealand Post paid tribute to these astronauts and celebrated the 25th anniversary of their historic moon landing with a historic event of its own: the launch of New Zealand's first hologram stamp depicting an astronaut walking on the moon with the earth and New Zealand in the background. 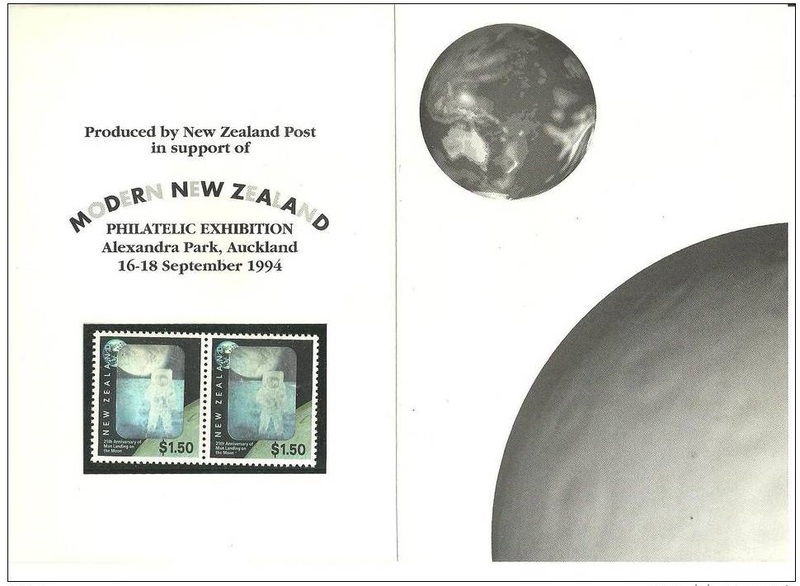 The hologram, which was designed by New Zealand Post, was produced by Woodmansterne of England and applied to the printed stamp by Southern Colour Print. While this was a great looking stamp, the holographic image did not photograph well. I have never found an image displaying this stamp to its full potential. 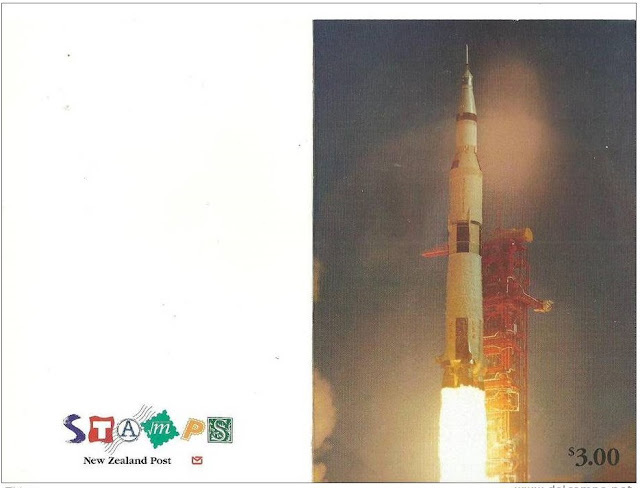 Even on NZ Post's own website, they don't come out well. $15.00 - Sheetlet of ten $1.50 stamps. The stamp was produced in sheetlets of 10 with the selvedge depicting outer space. 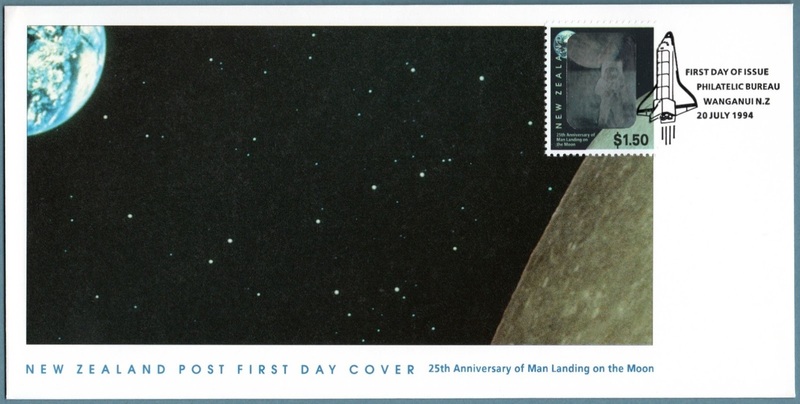 First Day Cover - 20 July 1994. This is a great photo showing the lunar surface to the right with the Earth in the background top left. This picture reminds me of that famous photograph taken by the Apollo 8 astronauts as the earth rose above the surface of the moon. The first time an earth-rise had ever been seen. 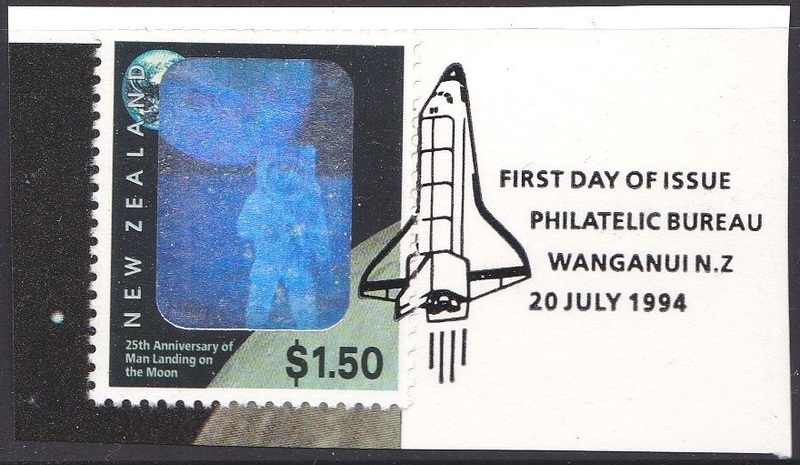 Close view of this special post mark showing the space shuttle. Front and back of a special exhibition card. Top shows a Saturn V rocket blasting off on an Apollo mission. Below are the exhibition details with a pair of $1.50 stamps. To the right is a view of the earth from lunar orbit. Period of sale: These stamps remained on sale until 20 July 1995. I've never seen this stamp before, in fact there are many stamps in this blog I have never seen. I am interested to see stamps that are different like this one with a holographic image, stamps with gold foil or even finely ground sawdust. I dont think many of these would appear in general postage, only first day covers. Yes, Nina. There seems to be a trend with NZ Post going for the collector market (sales) rather than postage. I see you tried a new layout of the Technical Information. While personally I never read that I notice it looks much more readible on the smaller screen of my phone. Yes we are having a lot of trouble with these Technical Sections. This new format works for both computers or phones. It needs a bit of fine tuning but looking good so far.